I do not think the heading of this article will raise bewilderment or incomprehension of any of you. That has been not a year since the talks about the death of the PDA market started, and the sales indexes prove distressing forecasts. However, the numbers vary, and for instance, analytic company of Gartner reports the market growth, at the same time IDC tells about the falling tendency. The discrepancy comes from the absence of a single common definition of smartphones and communicators. Thus, the Gartner's report on PDAs includes RIM's and Nokia's communicators. The main reason is rapid growth of smartphone and communicator popularity. A customer gets the same PDA capabilities and a phone capability as well. New cellular phones come equipped with a PIM organizer, can be synchronized with a desktop PC. And the quality of the screen (not the size but the resolution) in phones got closer to smartphones. Media combines often take the part of the market away from PDAs, and more frequently their multimedia functionality is higher than in PDAs. Still their influence is not as significant and will grow gradually. Pocket consoles like Sony PSP and Nintendo DS gained over a part of customers interested mainly in game capabilities of a PDA. PDAs have not become a necessity in a corporate media. And exactly in this segment Toshiba and other companies believed earlier. The position of Palm OS got extremely weak. 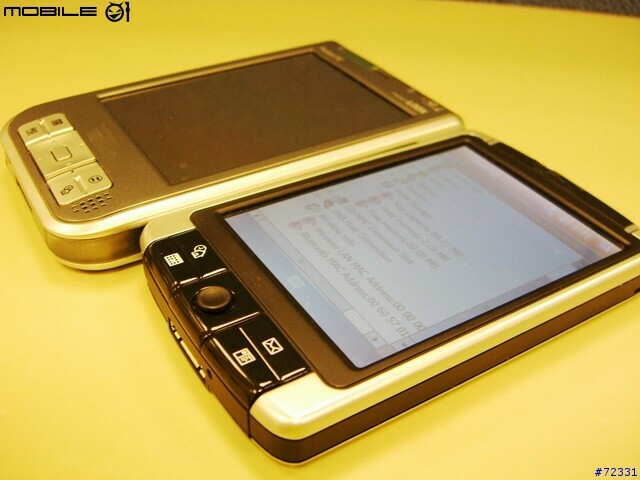 A part of potential Palm customers passed to Windows Mobile, and another part got out of the PDA market at all. Toshiba leaves the market. Toshiba e83 was the last model, and its launch was forced - already existent corporate contracts were to be closed. A Taiwanese company of Compal, Toshiba's ODM partner reduced all the PDA developments not concerning GPS navigation. The company of Sharp, an official maker of Linux based models stopped official exports having met low demand outside Japan. And the latest events - Asus stopped the production of its current PDA line, and all the developments not concerning GPS are closed. So, we won't see the continuation of a VGA model Asus MyPAL A730/w. And all is worsened with the fact that average price for a PDA grows, but not reduces, so PDAs get less available. That also reduces the sales. The main handheld manufacturers are afraid of investing money in new developments understanding the situation. And in fact, the companies restyle old models and transmitting the main focus to communicators. New ideas are absent. So, let's discuss the models of all makers together. Palm. This leader of the market has been copying the design of Palm Tungsten E varying only the colour and changing the filling a bit for several years. 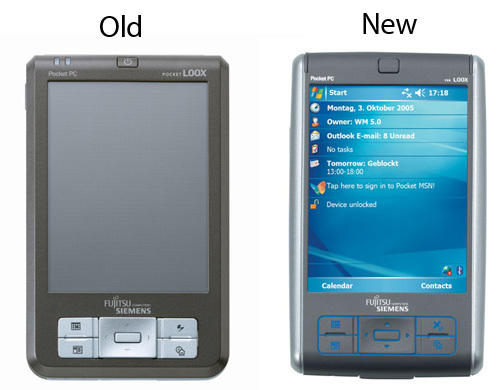 A new Palm TX differs only in the body colour and Wi-Fi module present, and the original design is completely preserved from the Palm Tungsten E's times (you can read details on Palm TX on our site). This design will act as a base for new Palm models, slightly the specs will vary and a GPS module will be added. 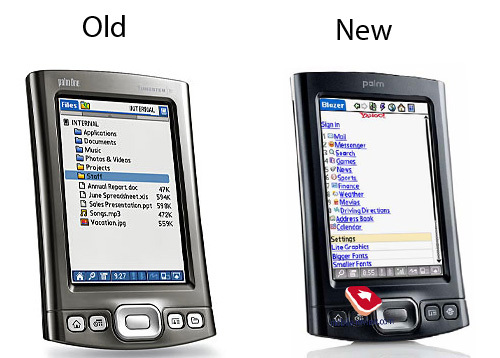 New ideas appeared in Palm Z22, mainly they concern the design (created a la Apple iPod), but inside that is an eased Palm Zire 31. HP. 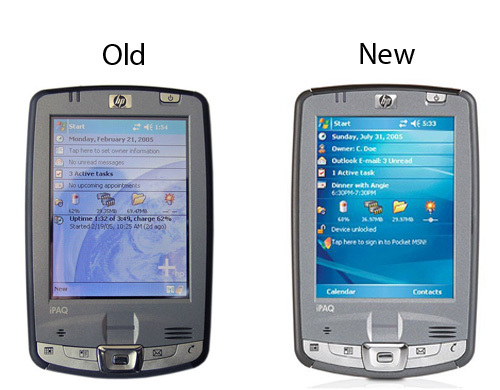 First the renewal of iPaq hx4700 to a new operating system was delayed till the next year, and then the company represented its HP iPaq rx1950 and renewals for the Paq h2000 series. As for HP iPaq rx1950, the design of HP iPaq h4150 was taken unchanged, the filing from HP iPaq h1940, added a new operating system, Bluetooth replaced with Wi-Fi (exactly, no Bluetooth in the models, but Wi-Fi is present, that is how the company ants to stress the low-end belonging of the model). 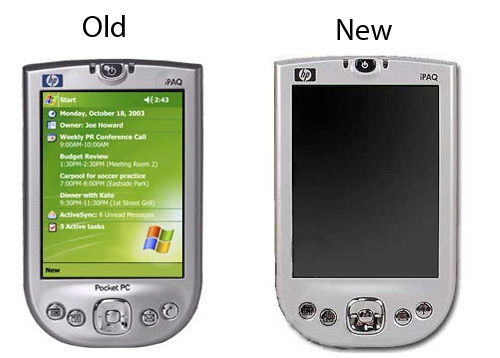 HP iPaq hx2190/hx2490/hx2790 stand out of the predecessors with a new operating system and the number of 90 in the name. And HP is not the only maker who decided that a new OS is enough for renewing old models (new memory organization, longer battery life). Dell acted the same way as HP. 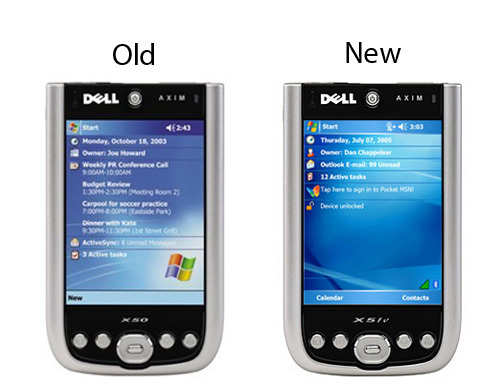 New PDAs of the Dell X51 series are not more than Dell X50 run by Windows Mobile 5.0. Fujitsu Siemens. The changes in new FS models are more significant - a GPS module is added. The design for the new models of the N500 series was taken from FS Pocket LOOX 420 with cosmetic changes, and the filling belongs to LOOX 710 (Compact Flash expansion slot was changed for a GPS module, the battery reduced, as well as the dimensions and weight). So, a desire to economize on design and R&D is to the fore. MiTAC. This Taiwanese maker launched Mio 168 RS as a renewal for Mio 168 with a new GPS chip (SiRFstarIII). A new Mio A201 (it is reviewed on our site) practically differs in nothing from Mio 168 RS (less attractive design and the presence of Bluetooth). Garmin. That is the second echelon player. Its new iQue M3 copies the design of iQue M5, in its turn based on the previous models, practically differs in nothing. The leading PDA companies on the market use old design and hardware developments. The innovations are Windows Mobile 5.0 and an integrated GPS module. Against this background, only two models look really new: the first is Acer n300 with a VGA screen and tiny size (the first VGA-PDA with one expansion slot), and the second is HTC Galaxy - the smallest Pocket PC and the best navigational PDA for the current moment (soon read the review on our site). Last year the main flood of the new devices fell on the summer, and this summer practically lacked announcements, which really put us on the guard, since the life circle for a PDA makes 12 months and very seldom reaches 18 months. And our fears proved - practically all the main models are clones of the old ones in design and have only a slightly developed hardware component. Really interesting models are only two, named above. All the new developments concern communicators. Here are upcoming Dell and Fujitsu Siemens' models, as well as interesting developments by HP, a very interesting model Mio A701 by MiTACm and let alone mass of fascinating models by HTC. In the companies' lines usual PDAs will more and more be replaced by communicators. Navigation. 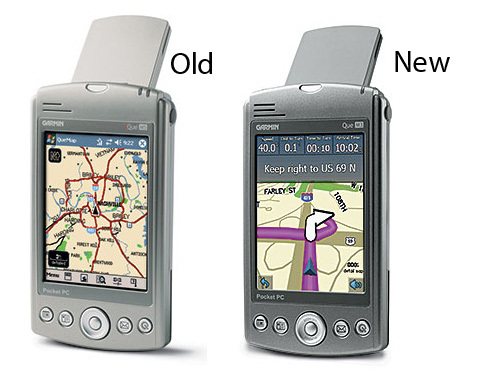 GPS is the base, which will hold the PDA market in 2006. Low-end PDAs. This segment is practically undeveloped; the market lacks handhelds cheaper than 200 USD. That is a potential direction, though no one desires to investigate this segment. Windows Mobile and Linux based multimedia combines. With integrating hard drives this segment will be seriously developed in 2006. Industrial PDAs for using in hard conditions. Though this segment is narrow, stably growing demand will be observed here. In the end, I'd like to remind that it would be more correct to speak not about the death of the PDA market, but about its degeneration into a communicator and smartphone market.